I’ve just got back from a long weekend at a farm in Dorset. The weekend was arranged as a metal detecting holiday but by far the most enjoyable moment was the badger watching. 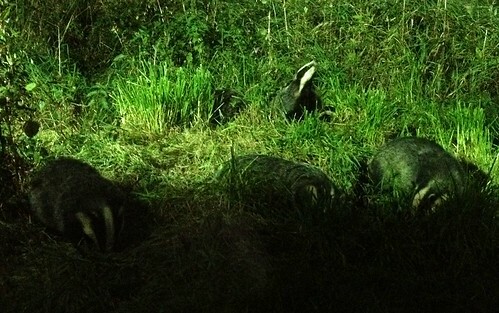 It turned out the owner of the farm we had booked had recently started attracting badgers to one area of the farm. She’d built a hide and floodlit an area for guests to sit and watch. She lured them with the promice of peanuts and the badgers obliged. It was very dark and cold and we had to sit absolutely still for a couple of hours but it was worth it. The badgers put on a great performance and I managed to get some good pictures on my iPhone and also some nice video clips.